Interval International has announced the affiliation of Palmares del Francés. Situated on the Atlantic Coast in the town of Santiago de Tolú, the fractional property is being built by Al Proyectar S.A., an established shared ownership developer in Colombia. 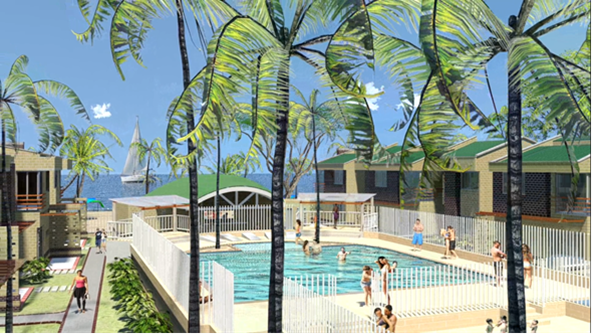 Upon completion, the oceanfront resort will feature of 37 fractional units set around a common area with tropical garden walkways, swimming pool, and hot tubs. Each includes spacious living and dining areas, a full kitchen with modern appliances, state-of-the-art electronics, and private terraces. Among the property’s other amenities are a white-sand beach, restaurant, Internet center, snack bar, event room, and playground. Activities available on-site and nearby are beach volleyball, fishing, snorkeling, scuba, kite boarding, and waterskiing. Visitors can take day trips to the ecological park on Isla Palma, one of the pristine Caribbean islands belonging to the Archipelago de San Bernardo. They can also participate in half-day excursions to the animal sanctuary at Manglares de Cispatá or the mangroves of Ciénaga de Caimanera.